Double Rainbow, originally uploaded by Scott Thomas Photography. It was raining on my way home in mid-October, 2009 when the Sun popped out. Being so late in the afternoon and the time of year, I knew there had to be a rainbow somewhere. There was, the most vivid oxbow double rainbow I had ever seen. I pulled over and took out my Apple iPhone 3G and did the best I could. Normally, I wish the iPhone could zoom in, this time, I wished it could go wider. As they say, the Best Camera is the one you have. 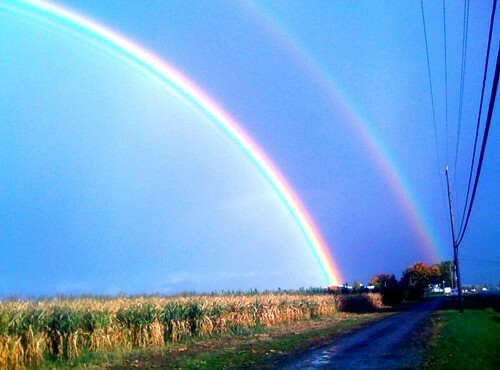 This entry was posted in Nature and tagged 3g, app, apple iphone, baldwinsville, best camera, field, flickr, landscape, luck, new york, rainbow, sky, st. patrick's day, storm, weather. Bookmark the permalink. Very lucky shot Scott. Not only the double rainbow, but also the lines in the road and the power lines. Not least a very clear image of “Alexander’s Dark Band” between the rainbows. Oh, I am very familiar. Yum! A very happy Paddy’s Day to you, Scott!! Thank you, Simone. Do they make a big deal of St. Patrick’s Day in Ireland? I think America has a queer idea of what the day is all about. Hooray! You got a seeing camera again. Maybe you’ll want to do some more close up photos. 😉 You from the Irish Hills of Michigan, Gerry? A beautiful photo. Did you PP it or is it straight from the device? I processed it in the Best Camera iPhone app. I gave it a shot of Candy (Boost Color). The iPhone 3G had washed out coloring and this brought it back. This is very close to what I saw. Maybe a touch enhanced. Not by much. The newer iPhone 4 has much better color rending. I spent some time up in Olympic National Park right out of college. I got spoiled with almost daily rainbows. One late afternoon, I saw three rainbows in different spots at the same time. I have yet to find any gold either but, for some reason, the joy of seeing rainbows makes up for it. It’s a beautiful shot. I’m glad you had a camera — any camera — with you to capture it.